I had a meeting here – it is a long way north up the A1, onto the Berwick OS map NU164202. 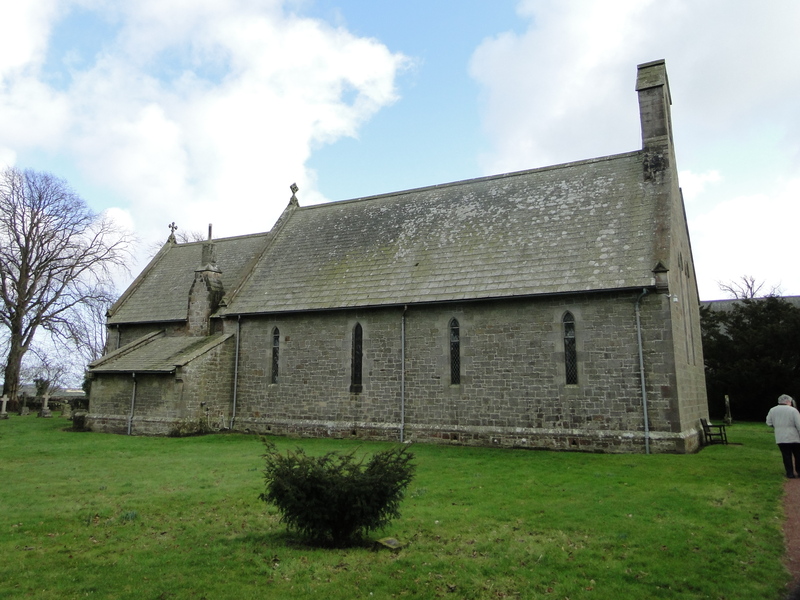 Pevsner gives the church two lines: “1862 by James Deason of London for the Duke of Northumberland. Small but good quality church in E.E. style”. Entering the churchyard on the north side, having parked on the road through the hamlet, I passed the war memorial, and was surprised to see that the only WW2 name is that of a woman. Inside the church is another memorial plaque to the lady – Sarah Elizabeth Dixon. There is a good website about the Queen Alexandra’s Imperial Military Nursing Service – http://www.qaranc.co.uk/qaimns.php. I can’t find any mention of Sarah, so I have emailed them to see if they have anything. If they do, I’ll edit the blog. 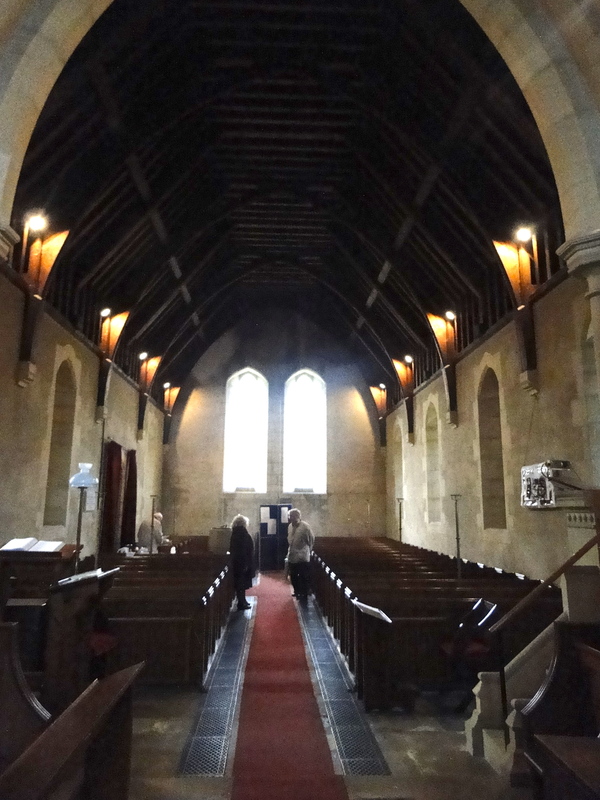 Not – sorry good folk of South Charlton – a particularly stunning church, but they had the kettle on and made us welcome. They have plans and I wish them well. 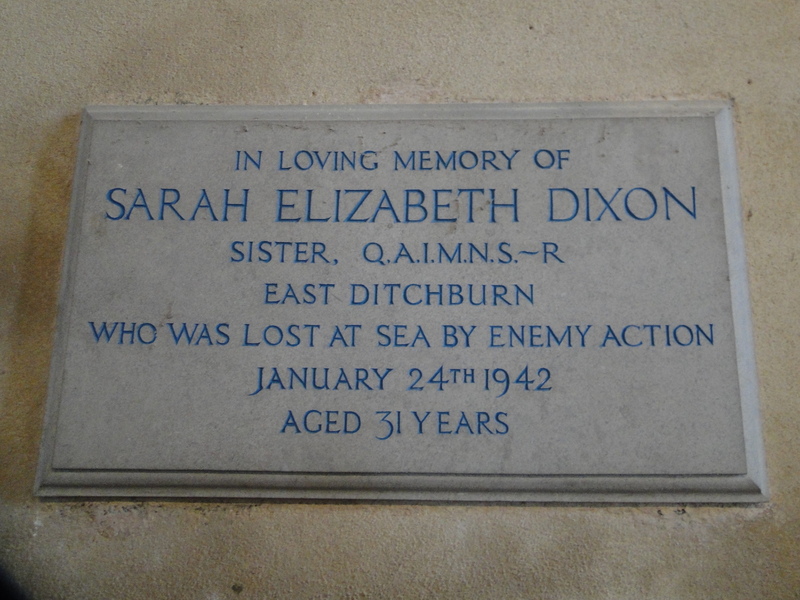 RE: Your post; South Charlton – St James (Posted March 5, 2013) – Sister Sarah Elizabeth Dixon memorial plaque. I realise it’s been a while since this entry was made, but I thought it might still be of interest to you, to know the circumstances of the tragedy surrounding the death of Sister Dixon, which occurred in the Mediterranean while on duty on the Hospital Ship St David. The St David was deliberately attacked and sunk by a German bomber, while transporting wounded soldiers from the Anzio beachhead at night in company with two other hospital ships. The captain and 12 crew as well as 22 Royal Army Medical Corps personnel (including 2 reserve QAIMNS nursing sisters, Sarah Dixon and Winnie Harrison) and 22 of the wounded patients lost their lives. When the attack took place, all three ships were fully illuminated as per the Geneva Convention. More info, including a detailed description of the sinking as well as a full list of casualties, can be found here: http://www.briancrabbmaritimebooks.co.uk/beyond-the-call-of-duty. I hope this tragic story is of interest and thank you for your very interesting blog. Sarah Elizabeth Dixon was my Aunt Bessie, my father’s oldest sister. I never met her (I was born in 1947) but she was talked about in the family. None of the rest of the family served in the armed services except the Home Guard (farming was a reserved occupation). However, shortly before his death, the youngest of Bessie’s siblings, Hedley, revealed that he had been part of Churchill’s secret “resistance” army in the case of invasion. 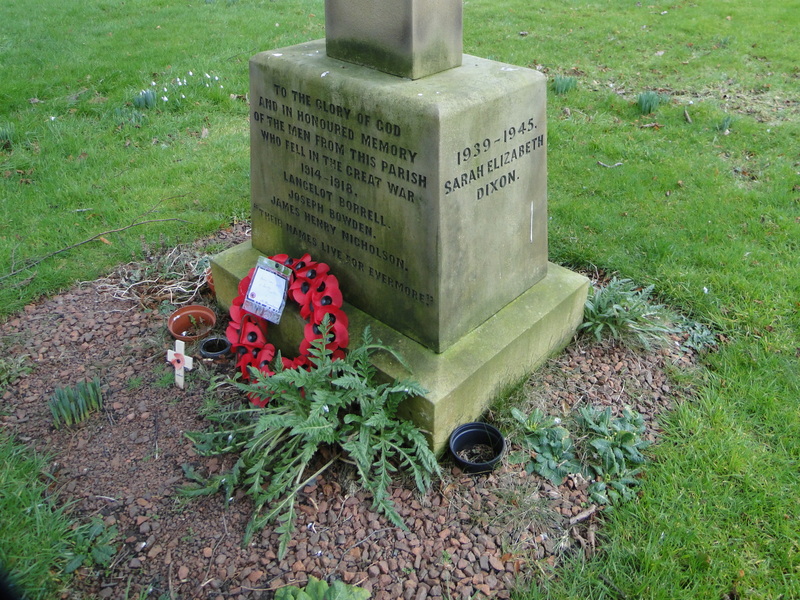 The memorial was erected in the Church before permission was granted on the advice of a Church Commissioner who had a holiday home in the village. He told my grandparents that it would be a very long process and that it was very unlikely that retrospective permission would be refused. 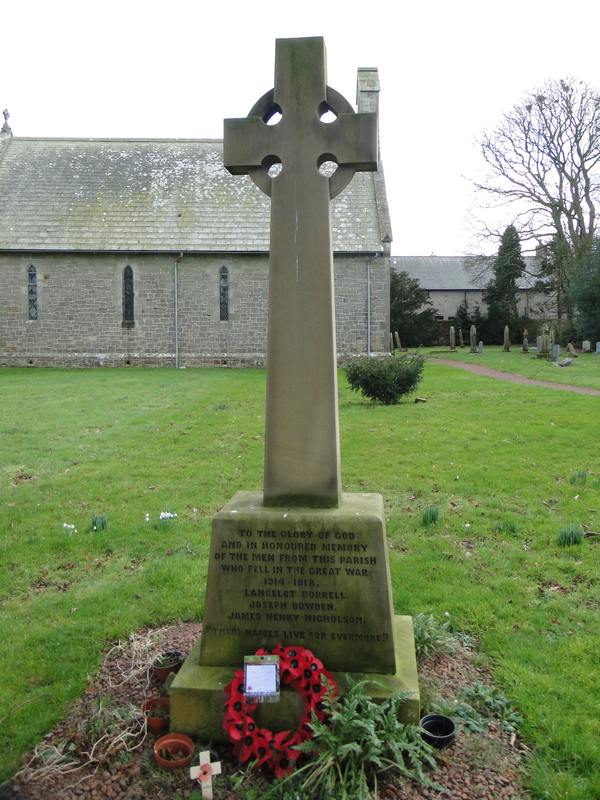 The farm, East Ditchburn, is actually in the parish of Eglingham which is where my uncle Hedley is buried and I believe that Bessie is on their war memorial. 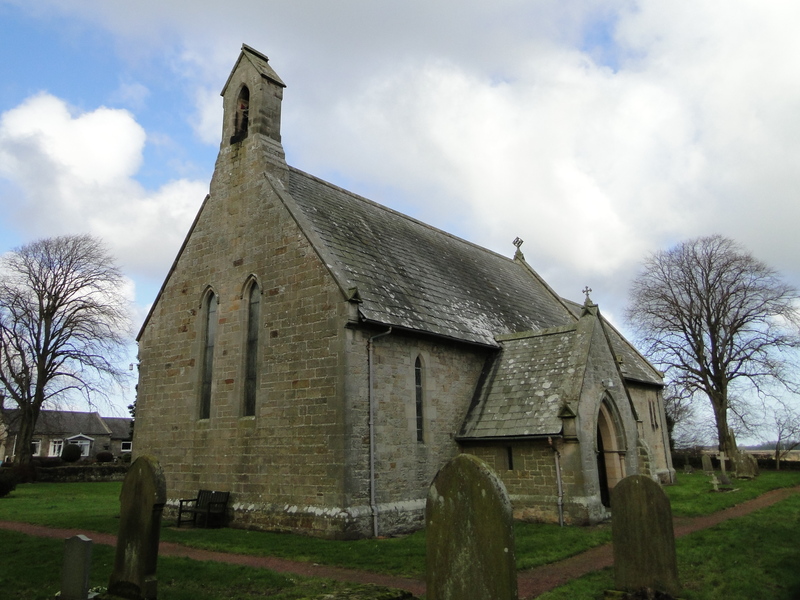 However, Bessie’s mother and father as well as my parents are buried at South Charlton (parish of South Charlton and Ellingham when I was a boy) which is where they attended church. Hedley’s eldest son, James, still farms East Ditchburn. I am aware that this is a long time since the original posting, but I hope that this comment is of interest to someone. I certainly found the original posting and Arthur’s comment of interest.